Irma will blast the northern Caribbean with flooding rain, damaging winds and rough surf this week, bringing life-threatening conditions to the islands. A similar scenario could play out somewhere along the Gulf or East coasts this weekend or next week, depending on where Irma tracks. Residents are urged to prepare now. “This hurricane has the potential to be a major event for the East Coast. It also has the potential to significantly strain FEMA and other governmental resources occurring so quickly on the heels of Harvey,” Evan Myers, expert senior meteorologist and chief operating officer, said. A landfall in Florida, Georgia and the Carolinas is all in the realm of possibilities. Irma could also head into the Gulf of Mexico. The exact path of Irma beyond the end of the week remains uncertain and will depend on a variety of moving parts in the atmosphere. “A large area of high pressure across the central North Atlantic is helping to steer Irma,” AccuWeather Hurricane Expert Dan Kottlowski said. This feature will be the main driving force of Irma over the next few days. As the weekend approaches, other factors will come into play. “The eastward or northeast progression of a non-tropical system pushing across the central and eastern U.S. this week will highly impact the long-range movement of Irma,” Kottlowski said. How fast or slow this non-tropical system moves will be an important factor on where Irma is steered this weekend into next week. The speed of this feature will determine when and how much Irma gets pulled northward or whether Irma continues on more of a westward track. This amount of uncertainty means that the entire southern and eastern U.S. should monitor Irma this week. Residents along the coast are urged to start preparing and making sure plans are in place to deal with the worst case scenario. This includes plans on how to evacuate and what is important to bring with you and your family. “As we saw just 10 days ago with Harvey, it is important to be ready to evacuate,” Myers said. Be prepared with a list of items you would need to take if you had 30 minutes’ notice or one hour’s notice or six hours or a day to evacuate. Due to Irma following so closely on Harvey’s heels and since FEMA and other government resources will be strained, more preparation and storm aftermath may rest on individuals, Myers said. It may be crucial to evacuate ahead of the storm, so preparation is key. If Irma were to make landfall as a Category 4 or 5 storm somewhere in the U.S., it would be in historical territory. “The U.S. has not sustained a direct hit from two Category 4 or above hurricanes in more than 100 years,” Myers said. Keep checking back to AccuWeather.com for updates on the status of Irma and where it may track in the days ahead. 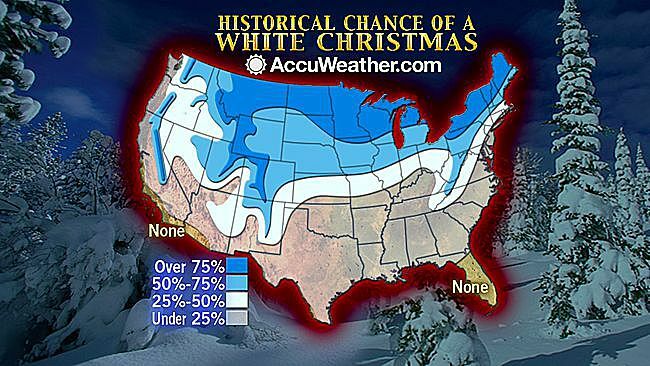 AccuWeather’s offers probabilities of a White Christmas. Get minute-by-minute weather through its mobile app, MinuteCast. AccuWeather, a leader in weather information and digital media, announced the results of a national survey that details how winter weather conditions affect consumer behavior by the minute, from road travel to holiday preparations. The AccuWeather MinuteCast® study polled 1,000 respondents across the U.S., revealing findings with some stark regional differences. MinuteCast enables drivers to check snow and rain conditions at their exact locations as well as their destinations, minute-by-minute allowing them to plan the best times for road travel and holiday shopping and make the most of every minute during the busy holiday season. Winter weather means more car time for Americans. The survey found that when winter weather hits, 87 percent of respondents give themselves up to 30 extra minutes when heading out on the road. Regionally, Midwesterners give themselves the most time to account for winter conditions during their daily drive, with 52 percent allotting an extra 16-30 minutes. 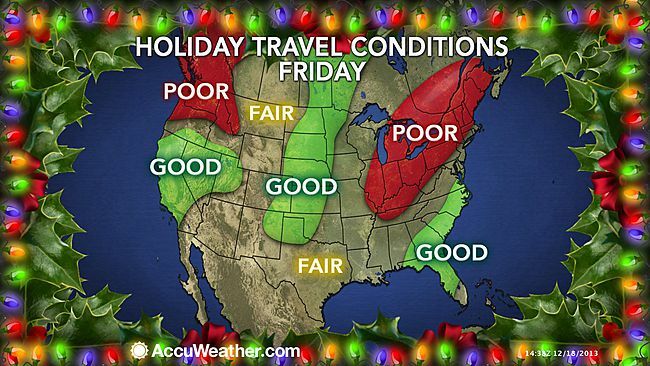 As minutes count down to holiday celebrations, weather also has a direct impact on retail shopping. The survey found that 58 percent of adults would not head out for holiday shopping in the event of a forecast of at least 4 inches of snow. Southerners are more likely to delay shopping in inclement winter conditions, with 35 percent stating that just 1-3 inches of snow would hold them back from retail brick-and-mortar stores. In contrast, in the Northeast, 33 percent of respondents stated that it would take a more significant snowfall amount of 7-9 inches to keep them from braving the elements.. The survey also found that the majority of respondents did not have to brave bad winter weather to complete their last-minute holiday list last year. To see how winter weather will impact last-minute shopping this season, go to AccuWeather.com or use the AccuWeather mobile app available on most popular digital devices for weather forecasts with Superior Accuracy™, featuring AccuWeather MinuteCast – the unique, patent-based, minute-by-minute precipitation forecast for users’ exact street addresses or GPS locations. It gives users by-the-minute precipitation forecasts for the next two hours, including precipitation type and intensity, start times, and end times for their exact locations. AccuWeather MinuteCast is uniquely supported by both national and international patented technology. AccuWeather is also inviting people to share how they are using MinuteCast to make every minute count through the AccuWeather MinuteCast Moments Sweepstakes. To share a MinuteCast Moments picture and caption and enter for a chance to win, visit AccuWeather’s Facebook page at www.Facebook.com/AccuWeather . Participants can also enter via Twitter or Instagram and must include the hashtag #MinuteCast with their entries. The sweepstakes began at 12:00 am ET on November 17, 2014 and ends at 11:59 pm ET on January 11, 2015 at 11:59 pm ET. Open to legal residents of the 50 United States, Washington D.C., and Canada (excluding Quebec) who are 18 years of age or older. Limit one entry per person per week. No purchase necessary. Winners will be selected at random after the sweepstakes ends. For complete sweepstakes rules, visit www.Facebook.com/AccuWeather. AccuWeather is forecasting that though parts of the Northeast and mid-Atlantic had a gradual introduction to fall, winter will arrive without delay. Cold air and high snow amounts will define the season – good for ski resorts but not so good for urban areas and Mid-Atlantic places where even the slightest amount of snow or ice wreaks havoc. Farther south, ice storms and snow events will threaten the Tennessee Valley and parts of the southern Plains. 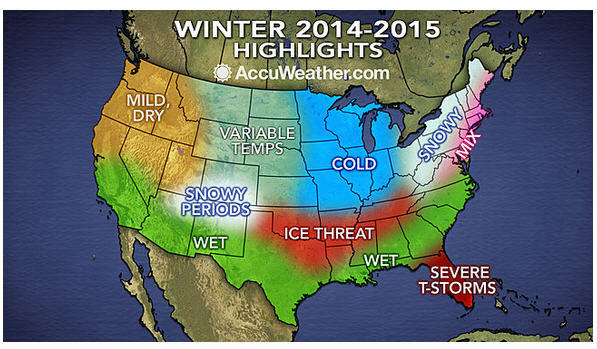 Much of the South can prepare for a wet winter, with some severe weather encroaching on Florida. The northern Plains will be somewhat inconsistent with variable, back-and-forth temperatures and below-normal snowfall. Meanwhile, the drought will persist in the Northwest and northern California and ease slightly farther south. “I think, primarily, we’ll see that happening in mid-January into February but again, it’s not going to be the same type of situation as we saw last year, not as persistent,” AccuWeather.com Expert Long-Range Forecaster Paul Pastelok said. “Places like Harrisburg, down to Hagerstown getting into the mountains, the Appalachians, I think that’s where you’re going to see your bigger, heavier amounts,” Pastelok said. “I’m very concerned about the Tennessee Valley to the Gulf Coast as far as extremes go this year,” Pastelok said. “These are big storms that are going to form and put down a lot of rain, but there may be breaks in between,” Pastelok said. In a story similar to the Northeast, the winter season has several cold months planned for the Midwest, though not quite as extreme as last year. Temperature wise, areas such as Duluth, Minnesota, and Green Bay, Wisconsin, may be 7-9 degrees warmer than last year’s three-month average. Below-normal snowfall totals are also forecast. Chicago could fail to reach 30 inches this year, and Minneapolis has an even greater chance of falling below normal. Farther west, the northern and central Plains will endure roller-coaster temperatures. Fewer clipper systems than normal will reach down into the area, preventing high overall snow totals. “That moisture source is needed to get above-normal snowfall for the region. I do believe there are going to be periods where moisture gets in there,” Pastelok said. “Northwestern Texas, western Oklahoma, Kansas, they can also see near- to slightly above-normal snowfall this year,” Pastelok said. “California, the northern Sierra and Sierra Nevada are going to be below normal, although I do think that they are going to get enough snow to hold back the drought just a little bit from getting any worse than it is,” Pastelok said. However, the winter isn’t all bad news for the drought-stricken region, Pastelok said. Finding out the weather in places you are traveling to is easier and more reliable now, so you can better plan what to pack and what to do during your visit. AccuWeather, a leading global digital media company, has acquired Sky Motion Research, Inc., of Montreal, Canada, an innovative developer of ultra-short-term and highly localized weather forecasts. With this acquisition, AccuWeather will now offer highly accurate, minute-by-minute weather predictions, including precipitation start and end times, at a hyper-local level. The new MinuteCast, Minute-by-Minute Forecast solution will be made available on all of AccuWeather’s mobile applications including iOS, Android, and Windows, as well as its website properties including accuweather.com and m.accuweather.com. Sky Motion pioneered the development of proprietary nowcasting technology that uses algorithms invented by Sky Motion Founder and Chief Technology Officer, André LeBlanc to track every rain cloud’s movement in real-time. The technology also tracks other weather variables such as wind and temperature and integrates ground observations to create a hyper-local forecast for approximately every half square mile, refreshing every five minutes. As part of the acquisition, Sky Motion’s facilities in Canada will be added to AccuWeather’s suite of offices, continuing its international expansion and becoming a key innovation and development center for the company. In addition, André LeBlanc will continue as an AccuWeather executive along with his software engineering resources. “We’re excited to be joining forces with AccuWeather. Their strong brand recognition will accelerate the discovery and adoption of MinuteCast beyond our wildest dreams,” said Maxime Julien, former SkyMotion Research Chief Executive Officer. The addition of MinuteCast to AccuWeather’s portfolio is part of its strategy to be the leading global digital media company that serves superior weather forecasts to more than one billion people worldwide. AccuWeather’s website properties provide users with numerous innovative weather forecasts including the 45-Day Forecast and lifestyle forecasts informing how weather affects travel, business planning, hobbies such as golfing and sailing, and conditions such as migraines and allergies. AccuWeather also offers animated and interactive weather radar and satellite maps, broadcast-quality weather videos and news stories, and up-to-date hurricane and tropical storm information in its Hurricane Center. The residents of Barrow, Alaska, on August 2 finally saw something they have not seen since May 10: a sunset. Ever since 2:54 a.m. on May 11, the sun has been in the sky, keeping the town in continual light. 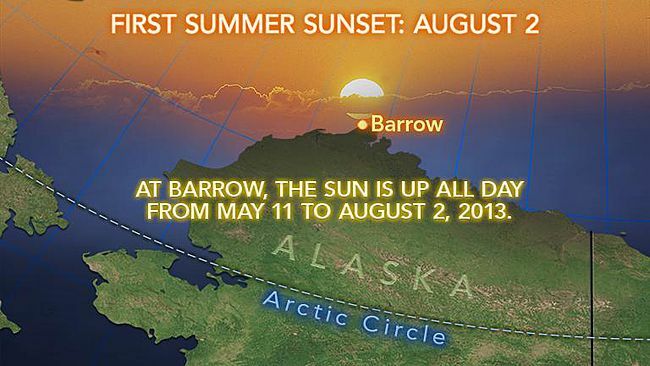 Early Saturday at 1:58 a.m. Alaska Standard Time (AKST), the sun will fall below the horizon, making it the first official sunset on summer for the town, AccuWeather.com Meteorologists Brian Lada and Jeff Rafach report. The reason that Barrow experiences the periods of continual light is due to their close location to the North Pole. As the Earth revolves on its axis, Barrow is turned toward the sun and remains light until the revolution of the Earth turns Barrow away from the sun. This summer has been unusually warm across the Last Frontier. So far this summer, temperatures in Barrow and Anchorage have averaged approximately 2.7 degrees above average, while temperatures in Fairbanks have averaged nearly 4 degrees above average. Although Anchorage has averaged above normal, the city has yet to break any daily temperature records this summer. The persistent warmth has managed to break a different type of record for the city, however. Over the past 16 days, Anchorage has either reached or climbed above 70 degrees F. This breaks the old record of set in 2004 when the city had a stretch of 13 consecutive days of at or above 70. In Fairbanks, the high soared to 84 degrees on Thursday. The high has reached 80 degrees F or higher for 31 days this summer. That is the most such days in Fairbanks, since record-keeping began in 1904. The average number of days Fairbanks reaches 80 degrees or warmer is 11. Currently, this summer is ranked as the second warmest for the city, falling behind the warm summer of 2004. This warmer weather has also contributed to development of lightning-producing thunderstorms that ignited of dozens of wildfires burning across Alaska over the past few weeks. According to the Alaska Interagency Coordination Center, there are currently 76 active wildfires across the state. This trend in warmer weather was expected to end with a dip in the jet stream will bring the return of more seasonable temperatures across the state, AccuWeather forecast. For more information, visit accuweather.com.